The news first popped up on social media. "Is the Joinery going away?" someone wrote, and then shared a link to a story about a big building being proposed for the same address that the craft furniture business has had for 22 years. Initial reactions were split between speculations about The Joinery's future, and worries about the looming development – a full-block five-story apartment building, with 178 units. The word "insane" cropped up more than once as neighbors began to grapple with the concept. People seemed especially concerned about so many more cars being added to an already congested arterial. Members of the Woodstock Neighborhood Association's Land Use Committee (WNA LUC) brought each other up to speed on the proposal at their February 20th meeting. The committee had just found two new Co-Chairs, Thatch Moyle, a planning consultant who lives and works in the neighborhood, and Les Szigethy, a retiree with a background in construction. Neighbors had contacted both the WNA and the Woodstock Community Business Association seeking more information about the proposal, and Moyle and Szigethy put it on the agenda for the LUC's March 20th meeting, figuring more would be known by then. The block in question – bounded by S.E. Woodstock Boulevard to the north and Martins Street to the south, between 48th (across from Woodstock Laundry) and 49th Avenues (across from Woodstock Library) – is fully owned by Marc Gaudin, who founded The Joinery in 1985. Initially based at S.E. 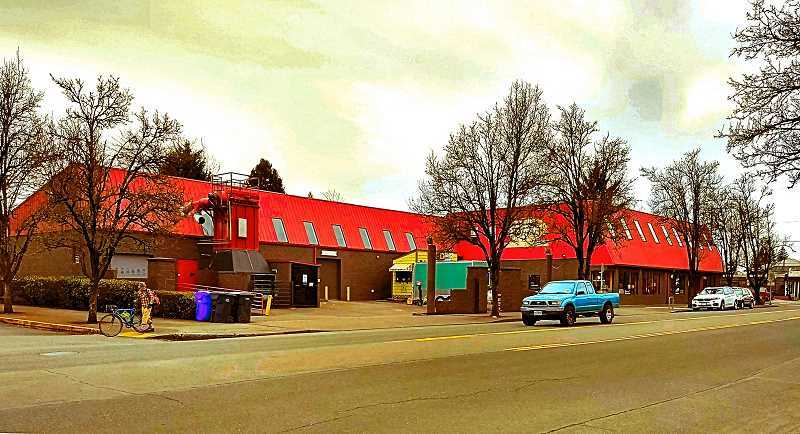 10th and Division, Gaudin moved The Joinery to its Woodstock location after buying the building from Bill Gander of Standard TV and Appliance in 1997. At that time, he let the owners of all the homes on the block behind The Joinery know he was interested in purchasing, and within ten years he owned every property on the block. Gaudin proceeded to remodel these houses via The Joinery, which provided work for Joinery employees during a lean year. Five and a half years ago, "after producing $50 million of furniture, I thought it best to sell and retire," says Gaudin. After selling his business to Jon Blumenauer, he continued to lease the building to The Joinery, while entertaining ideas for future full-block development. Several developers approached Gaudin with unsolicited proposals that didn't interest him; but finally a company called Mill Creek Residential came knocking with a plan that resonated with his own vision. 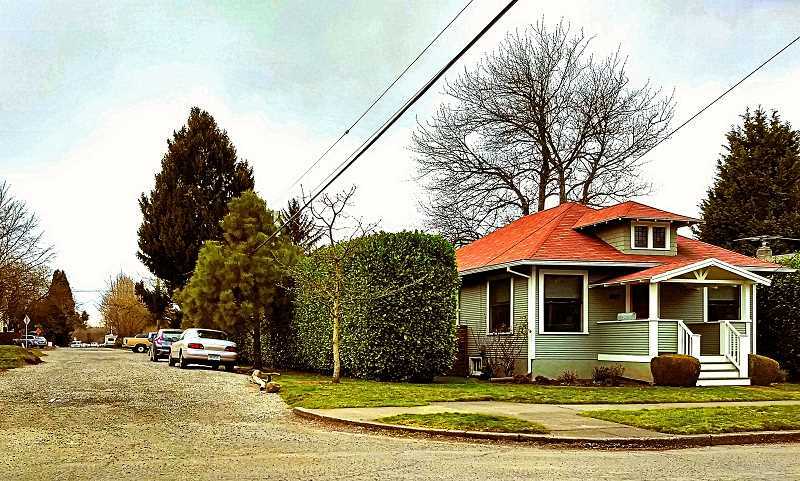 Mill Creek Residential is a national real estate developer that established an office in Portland at the time of its founding in 2011, along with offices in other growing cities in Texas, California, and the northeast region of the U.S., as well as in the northwest. The company specializes in the type of development they are proposing for Woodstock: mixed-use apartment complexes, with commercial space on the ground floor and underground parking. According to Gaudin, The Joinery had passed on an option to purchase the block, a decision he felt he understood, as the founder and former owner of the company. He pointed out that the current Joinery building is unreinforced masonry, and would likely be very expensive to remodel to the city's new earthquake preparedness standards. Also, in his opinion, Woodstock had never been the best market for the high-end furniture store. While Blumenauer said business has been fine in Woodstock, he confirmed an employee's assertion that The Joinery was growing, and needed a much larger shop facility to sustain that growth. With the current lease term expiring in October 2019, he has been weighing the option of renewing for five years, against pulling up stakes and moving both shop and the showroom to a different Portland location. Blumenauer emphasized that the main driver of The Joinery's decision-making process is "financial feasibility", and it appears a different location is apt to be much more economically feasible for the business than staying in Woodstock. He confirmed The Joinery was in the process of checking out a promising site in the St. Johns neighborhood (among others), but said it is premature to announce any plans or give formal notice to his landlord. He said he expected to be able to firm up his plans within two months. With a nod from Gaudin, banking on the inevitable, Mill Creek directed Leeb Architects to begin moving the Woodstock project forward on their behalf, leading to the present "early stage" – where public notice is required. The opportunity was initially brought to Mill Creek's attention by a real estate broker who apparently knew something about The Joinery's lease situation. Another factor in the timing of the development is a zoning change enacted with the June 2016 adoption of the city's 2035 comprehensive plan, which facilitates full-block development for this property, along with a handful of others along Woodstock Boulevard. But, until final notice is provided to Gaudin that the business is definitely moving, he cannot move forward in selling the block to Mill Creek Residential, and construction cannot move ahead unless and until The Joinery moves. So even though the development appears to be going forward, no one can yet say the project is a "done deal". WNA Land Use Committee "Chair Emeritus" Terry Griffiths, a long-time Woodstock resident who lives within a few blocks of the boulevard, got to preview Mill Creek's plan at the March 5th pre-application conference convened by the Portland Bureau of Development Services (BDS), along with this reporter (also a member of the WNA L.U.C. ), and two concerned neighbors – one who owns a business on S.E. 48th Avenue, and one who owns a home on 49th. A pre-application conference is an informational meeting where representatives of various city bureaus provide detailed information to the person interested in pursuing a development project in the city. The purpose is to provide information to the applicant to help them prepare a complete project proposal, and the conference is required prior to submittal of all Type IV Land Use Reviews (those involving demolitions). Despite the project having gotten this far in the planning phase, Leeb made it clear at the pre-application conference that the project is in the "very early stages" of design work. The plan's concept drawings seem to depict a fully designed edifice, but he said it is really just a "placeholder", outlining the basic form, footprint, and height of the building, with many design details yet to be determined. The pre-app conference was an important step in guiding those details by clarifying what exists at the site, and what the city will require in terms of water and sewer hookups, stormwater management, affordable housing options, access in case of fire, and street improvements, among other considerations, should the project move forward. A few basic details emerged about the proposal in the March 5th pre-application conference, and in subsequent conversations with developers: The structure of the building will be comprised of a concrete basement with wood-frame residential construction above. The basement will have parking spaces for 130-140 automobiles, with the entrance and exit planned for 48th. Above that will be 7,000 square feet of commercial space on the ground floor facing Woodstock, plus four to five floors containing about 178 residential apartments in various configurations, with a number of "affordable" units included. The height of the building will be capped at 45 feet. Along Woodstock Boulevard, the building footprint will not extend any further than the current Joinery showroom, so as to retain the wide pedestrian way. There will be additional setbacks at the back end, as well as "step backs" at the height of 35 feet to soften the face of the building where pre-existing residential developments are located across the street (i.e., the full length of Martins, as well as 50 feet on 49th and 100 feet on 48th). To meet the city's requirement of 15 percent overall landscaping, the building will feature plantings where the building steps back on 48th and 49th, and an open courtyard in the middle for use by residents, as well as the usual street trees required to replace trees lost to development. Asked about the project timeline, Leeb projected a start time of 9 to 12 months from now, and he estimated construction would take about 24 to 26 months to complete, once it begins. Leeb associates clarified that the existing houses on the block would be deconstructed, with as many materials recycled as possible, rather than being demolished and taken to a landfill. Due to past complaints from too many city residents caught unawares of big developments impacting their neighborhoods, the City of Portland now requires applicants to present project plans to the neighborhood in which they plan to build, before submitting the permit application. At Leeb's request, the Woodstock Neighborhood Association scheduled a public meeting, which has been set for Thursday, April 11, at 7 p.m. at All Saints' Episcopal Church, 4033 S.E. Woodstock Boulevard. With representatives of Leeb Architects and Mill Creek Residential presenting and being available for Q&A during this early stage, this is the ideal time for anyone in the neighborhood who wants to voice concerns or convey ideas to the project design team about the proposal. Mill Creek Development Associate Cassidy Bolger told THE BEE that their team was looking forward to the April 11th conversation with Woodstock neighbors, and will definitely take people's comments into consideration in their design process. In the end, however, as attendees at the city's pre-app conference were reminded by BDS Conference Facilitator Jean Hester, this is a "by right" development – meaning that as long as property owners follow the rules set out in city code for the designated CM2m (MU-N) building zone, they will be allowed to build their project. WNA Land Use Committee Co-Chairs Thatch Moyle and Les Szigethy are prepared to help residents in and near Woodstock who want to learn and understand more about Portland land-use matters, and want to try to influence the shape of future developments where they live. Committee meetings are held on the third Wednesday of each month at 7 p.m. at the Woodstock Community Center, 5905 S.E. 43rd Avenue, a half block north of Woodstock Boulevard.